Suvasvesi is a lake in Eastern Finland near the town of Kuopio. 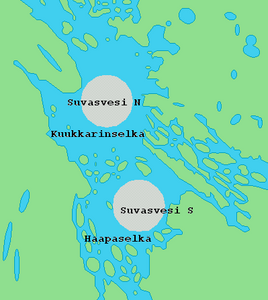 Suvasvesi consists of two circular open lakes, Kuukkarinselkä in north and Haapaselkä in south. The lakes are separated by a group of islands. The lake has 688 islands in total. The area of the lake is 234 square kilometres making it the 18th largest lake in Finland. Kuukkarinselkä is the third deepest lake in Finland measuring 89.0 metres in the deepest point. In 2001, shatter cones were found in Kuukkarinselkä making it the 6th known impact crater in Finland. The crater, usually referred as Suvasvesi North crater, is located in the center of Kuukkarinselkä and measures about 3.5 kilometres in diameter. Its age is estimated to be about 85 Ma but the Earth Impact Database gives a broader span of less than 1000 Ma.